"I'm ... proud to carry with me the goodwill of the American people, and a greeting of peace from Muslim communities in my country: Assalaamu alaykum." This Islamic greeting, here written "Assalaamu alaykum," is for one Muslim to address to another. By saying these words, Obama hints at his being a Muslim. 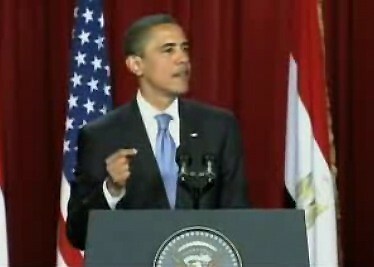 Barack Obama speechifying in Cairo on Islam. "The relationship between Islam and the West includes centuries of coexistence and cooperation, but also conflict and religious wars. More recently, tension has been fed by colonialism that denied rights and opportunities to many Muslims, and a Cold War in which Muslim-majority countries were too often treated as proxies without regard to their own aspirations." Obama here regurgitates the Islamist view of history. "Violent extremists have exploited these tensions in a small but potent minority of Muslims." Again, the Islamist message. "America and Islam are not exclusive and need not be in competition. Instead, they overlap, and share common principles—principles of justice and progress; tolerance and the dignity of all human beings." Islamists are divided on this topic. To take two well-known American converts to Islam: Robert Crane argues for the compatibility of American and Islamic values while H. Rap Brown argues for their incompatibility. No surprise that Obama chooses the former version. "As the Holy Koran tells us, 'Be conscious of God and speak always the truth'." Note the use of "Holy Koran," a translation from the standard reference in Arabic, al-Qur'an al-Karim. "my own experience. I'm a Christian, but my father came from a Kenyan family that includes generations of Muslims. As a boy, I spent several years in Indonesia and heard the call of the azaan at the break of dawn and at the fall of dusk. As a young man, I worked in Chicago communities where many found dignity and peace in their Muslim faith." A sly way for Obama to associate himself with Islam without acknowledging the elephant in the room – that he himself was born and raised a Muslim. "As a student of history, I also know civilization's debt to Islam. It was Islam—at places like Al-Azhar—that carried the light of learning through so many centuries, paving the way for Europe's Renaissance and Enlightenment. It was innovation in Muslim communities that developed the order of algebra; our magnetic compass and tools of navigation; our mastery of pens and printing; our understanding of how disease spreads and how it can be healed." True enough, but it's also true that these advances took place about a millennium ago since – something Obama tactfully avoids mentioning. "Islam has always been a part of America's story." This is among the weirder elements of the speech. Obama states that "since our founding, American Muslims have enriched the United States." Hardly, unless one counts the tiny percentage of African slaves who were Muslim. "I consider it part of my responsibility as President of the United States to fight against negative stereotypes of Islam wherever they appear." What at first appears to be an astonishing statement turns out, when put in context of the past two decades, to reiterate a well-established pattern. For details on that pattern see my two writings, "The United States Government: Patron of Islam?" and "The United States Government, Still the Patron of Islam." "much has been made of the fact that an African American with the name Barack Hussein Obama could be elected President." Note how that middle name, anathema during the election campaign, is now trotted out for foreign policy purposes. "nearly 7 million American Muslims in our country today." I wrote on this inaccuracy at "Assessing Obama's Cairo Speech." "there is a mosque in every state in our union, and over 1,200 mosques within our borders. ... the United States government has gone to court to protect the right of women and girls to wear the hijab and to punish those who would deny it." Impossible to imagine comparable statements about Christianity. "America is not—and never will be—at war with Islam." The historical part is true enough. See my column, "In 1796, U.S. Vowed Friendliness With Islam." How Obama knows the future I cannot explain. "Al Qaeda killed nearly 3,000 people on [9/11]. The victims were innocent men, women and children from America and many other nations who had done nothing to harm anybody." Coming from Obama, until recently positioned at the far left of American politics, this statement bears noting. One could just as easily imagine him blaming the victims. "America's strong bonds with Israel are well known. This bond is unbreakable. It is based upon cultural and historical ties, and the recognition that the aspiration for a Jewish homeland is rooted in a tragic history that cannot be denied. Around the world, the Jewish people were persecuted for centuries, and anti-Semitism in Europe culminated in an unprecedented Holocaust." This strange reading of Israel's origins confirms the Islamist view of Israel – as a concession made by Westerners guilty about their treatment of Jews. "the Palestinian people—Muslims and Christians—have suffered in pursuit of a homeland." Note that no Jews rank as "Palestinians." "All of us have a responsibility to work for the day when ... the children of Abraham to mingle peacefully together as in the story of Isra, when Moses, Jesus, and Mohammed, peace be upon them, joined in prayer." A pious Muslim might utter this sentence, not a practicing Christian. Quoting the Koranic story of the al-isra'? And saying "peace be upon them?" Pious Muslims say in Arabic عليهم السلام, 'alayhim as-salam, after mentioning the names of prophets, including Moses and Jesus. (Muhammad's name, however, is followed by a different salutation, عليه الصلاة والسلام, 'alayhi as-salat wa's-salam, "Blessings and peace be upon him.") This is Obama's strongest signal of his Muslim identity. "it is important for Western countries to avoid impeding Muslim citizens from practicing religion as they see fit—for instance, by dictating what clothes a Muslim woman should wear. We can't disguise hostility towards any religion behind the pretence of liberalism." A curious statement, given that liberals and leftists are the ones more prone to accommodate what Muslim women wear. "I reject the view of some in the West that a woman who chooses to cover her hair is somehow less equal." Lawful Islamists could not ask for a better brief endorsement of their outlook. "while America in the past has focused on oil and gas when it comes to this part of the world, we now seek a broader engagement. On education, we will expand exchange programs, and increase scholarships, like the one that brought my father to America. At the same time, we will encourage more Americans to study in Muslim communities. And we will match promising Muslim students with internships in America." More hints about Obama's Muslim identity. "we should choose the right path." An apparent allusion to الصِّرَاطَ المُستَقِيمَ, as-sirat al-mustaqim, the straight path, that Muslims ask God to guide them toward each time they pray. "The Holy Koran tells us: 'O mankind! We have created you male and a female; and we have made you into nations and tribes so that you may know one another.' The Talmud tells us: 'The whole of the Torah is for the purpose of promoting peace.' The Holy Bible tells us: 'Blessed are the peacemakers, for they shall be called sons of God'." A curious trio: Why Holy Koran and Holy [New Testament] Bible but just plain Talmud? And why the Talmud rather than the Tanakh (Old Testament)? As with so many other of Obama's prior references to Jews, Christians, and Muslims, this one is fraught with implication and ambiguity. All of us have a responsibility to work for the day ... when the Holy Land of the three great faiths is the place of peace that God intended it to be; when Jerusalem is a secure and lasting home for Jews and Christians and Muslims, and a place for all of the children of Abraham to mingle peacefully together as in the story of Isra, when Moses, Jesus, and Mohammed, peace be upon them, joined in prayer. It is striking that Obama refers to Israel and the Palestinian territories as "the Holy Land" of Islam. This is not true. Islamic devotion is focussed upon Mecca as the locus of pilgrimage and devotion. In Islamic traditions about Muhammad's night journey, he leads Adam, Moses and Jesus in prayer at the "Farthest Mosque," a place which Obama links to Jerusalem. However this association with Jerusalem cannot be justified on the basis of the canon of Islam (the Qur'an and the Sunna). It is a polemical link to draw, affirming the supercessionist Islamic view of Jerusalem as an Islamic holy site. The expression 'peace be upon him' is obligatory for pious Muslims after mentioning prophets of Islam, such as Moses and Jesus. By using this phrase – which Arabic-speaking Christians do not use – Obama signals his participation in and identification with the community of Muslims. He is saying "I am an insider to the Muslim community." Obama knows how to talk like a Muslim, and is doing so deliberately to identify with his audience. While this might come across to some as mere politeness, peace-making and bridge building, the fact is that the phrase "peace be upon him," used for a group which includes Muhammad, implies reverence. It implies that Obama reveres Muhammad as a prophet of Islam, and indeed as pre-eminent among the "prophets of Islam," a group which includes Moses and Jesus. Coming from a self-confessed, baptised Christian, this seems as incongruous as an orthodox Jew calling Jesus of Nazareth "the Messiah." For some, this could signal that Obama has crossed over the bridge and is surveying the chasm which separates world religions from the Islamic side. And he wants Muslims to know this. The United States Government: Patron of Islam?